I had been bouncing around the Andaman Islands and landed up in Krabi. A party crowd washed down to the coast for the long weekend, bought fireworks by the armful and let them off on the beach. Street food stalls appeared all the way down the road through Nopparat Thara. Chicken skewers and air-dried squid were piled up on trestle tables; gallons of chilli sauce, hundreds of quartered limes. Smoke from the grills drifted towards Ao Nang. A vendor made som tam in an earthenware mortar, bashing the garlic and chilli, the shredded papaya, the snake beans and tomatoes. I expected a party on New Year’s Eve on the ponderous curve of peachy sand. But the only poster I saw was for a buffet and live band at a hotel in Ao Nang, and that was hardly worth staying up for. But, with half a day left to run of the year, I spotted a flyer for Luna Bar (presumably the model for Moon Bar in Richard Arthur’s I of the Sun) which promised deep house and EDM, fireworks and whisky buckets. More fun than a live band and buffet, for sure. Luna was ominously quiet at 10pm, when I wandered in and scooped up a bucket of the sort which I took to the beach as a child. It came with a quarter of Sang Som whisky, a bottle of Coke and an energy drink and I tipped them in and walked through to the beach, where the holiday crowd was still exploding ordnance. (The firework sellers did well that night.) The bar began to fill up as the year faded out and the crowd spilled onto the beach. They crammed together in raggedy rows, like rush hour commuters, holding up paper lanterns half their own size, lighting them and letting them go. The flickering lights stretched the length of the beach. There were forty, or fifty, or more in the air at a time. 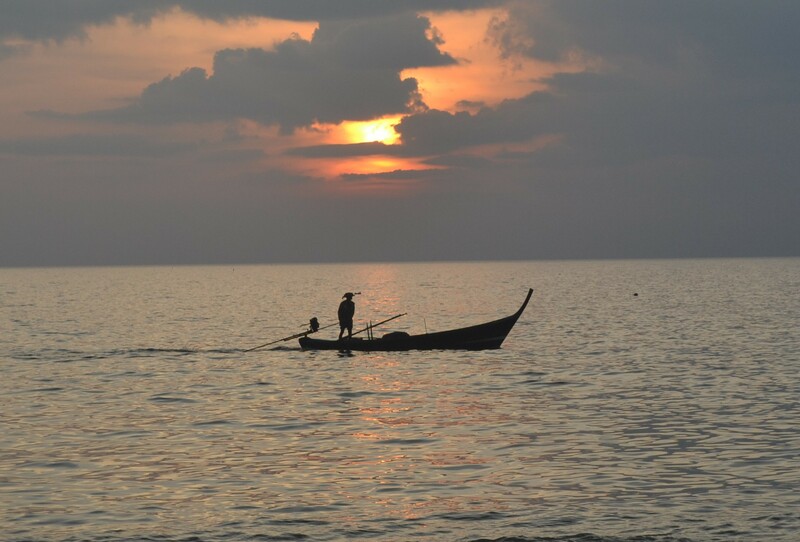 A few, swayed by gusts, caught fire and dropped to the water: the rest floated out over spectral karsts, way out into the Andaman Sea. Then, at midnight, the music stopped and giant Roman candles sputtered into flame on posts along the waterfront. Explosions reverberated like howitzer shells and the glorious colours spilled across the sky. Lines of racing yellow tadpoles mutated into pin cushions of pink, blue and green, distorted, collapsed and came back to earth as a glittering, sparkling downpour. All the stresses and disappointments I had run away from back home seemed a lifetime ago right then. Your writing invokes such vivid imagery — great for armchair traveling when one can’t get away from the office! I look forward to following your blog and glad I discovered it through Freshly Pressed.